Shirt, pants and waist sash. Size: STANDARD (fits up to 44 jacket size). 100% Polyester (exclusive of trim). 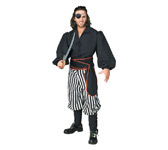 This pirate costume is designed to emulate typical sailor garb encountered on any vessel, especially a pirate ship.